Noel Cintron, who worked as Trump's wheelman for 25 years, is suing the Trump Organization and says he is owed more than $350,000. 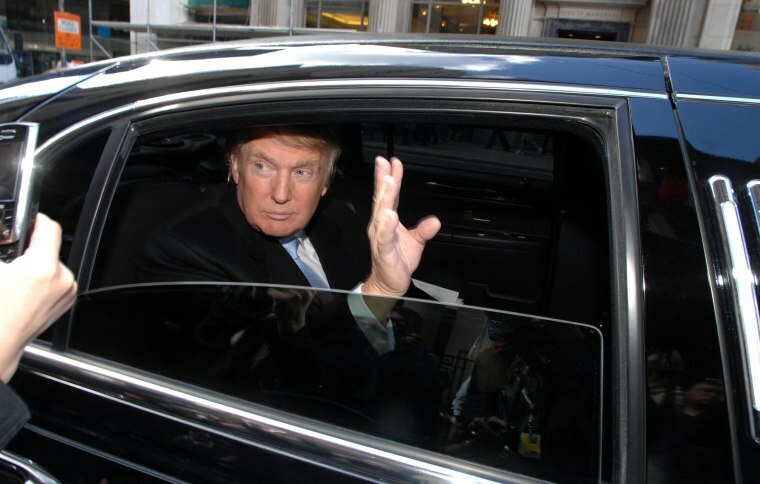 A man who worked as Donald Trump's personal driver for a quarter of a century filed suit against the president's company on Monday, claiming he wasn't paid for thousands of hours of overtime. In a harshly worded suit filed in New York State Supreme Court, Noel Cintron's lawyers claimed that Trump, "in an utterly callous display of unwarranted privilege and entitlement and without even a minimal sense of noblesse oblige … exploited and denied significant wages to his own longstanding personal driver." Cintron — who served as Trump’s personal driver for more than 25 years and gave up the responsibility after the Secret Service took on the role in 2016 — said he was owed overtime wages for about 3,300 hours of driving over the past six years. Over a 25-year period, Cintron says in the suit he worked 50 to 55 hours a week and earned a base salary but was never paid overtime for the time he worked beyond 40 hours per week, as his lawyers said is legally required. In total, Cintron is owed "in excess of $350,000," Larry Hutcher, one of Cintron lawyers, told NBC News. That sum comprises $180,000 in back wages, plus interest for six years, as well as punitive damages — which would be awarded if the judge found that Trump "knowingly failed to pay." The suit lists the Trump Organization as a defendant but not Trump himself. In a statement, Amanda Miller, a spokesperson for the Trump Organization said, "Mr. Cintron was at all times paid generously and in accordance with the law." "Once the facts come out we expect to be fully vindicated in court," Miller added. The White House referred questions about the suit to the Trump Organization. Cintron added in the suit that he hadn't been awarded a raise in nearly 10 years. "President Trump's further callousness and cupidity is further demonstrated by the fact that while he is purportedly a billionaire, he has not given his personal driver a meaningful raise in over 12 years!" Cintron’s lawyers wrote in the suit. Cintron was earning an annual salary of $62,700 in 2003, the suit said, before getting a bump to $68,000 in 2006. But in 2010, Trump "purported to increase plaintiff’s annual salary by $7,000, to a total of $75,000 per year" but that raise came at the expense of Cintron's health benefits, which cost the Trump Organization about $18,000 a year. He did not receive another raise after that, Cintron said.